Wow! Has it really been a year since our Chicken Involtini experiment? We did so well getting the first two recipes up, Chicken Involtini Part I (Apple & Bacon) & Part II (Collards, Feta & Bacon), our most popular blog posts to date, thanks to Foodpress and WordPress. One would think that with the fame and popularity of the earlier posts, we would be blogging about stuffed chicken on a daily basis, at the very least the much promised involtini part III would have gone up right away. Alas, other food obsessions stole our attention and Steve waited and waited to get his version of involtini written up and then time got away from him. We figure since we’re growing mushrooms and our last post was all about that experiment, now might be a good time to revisit this unusual preparation for chicken and mushrooms. It’s also our 150th blog post – a major accomplishment even if it has taken us 3 years to reach this goal. The idea here was to produce a boneless, skinless breast that was flavorful and moist. Seasoning bland chicken breast is rarely an issue for the home cook. The challenge is cooking the meat through without drying it out. Most of us fail most of the time. We took a slow poach approach to this one, simmering the stuffed breast in a broth seasoned with mushroom, rosemary and whisky. The woodsy flavors of dry mushroom, resinous rosemary and smoky whisky made for an interesting dish. While the technique looks to be a bit fussy, it wasn’t at all difficult. You just need to take the time to rehydrate the dry wild mushrooms. Everything else comes together quickly. Place dry mushrooms in a medium bowl. Pour two cups boiling water over the dry mushrooms. Set aside to rehydrate, about 10 minutes. 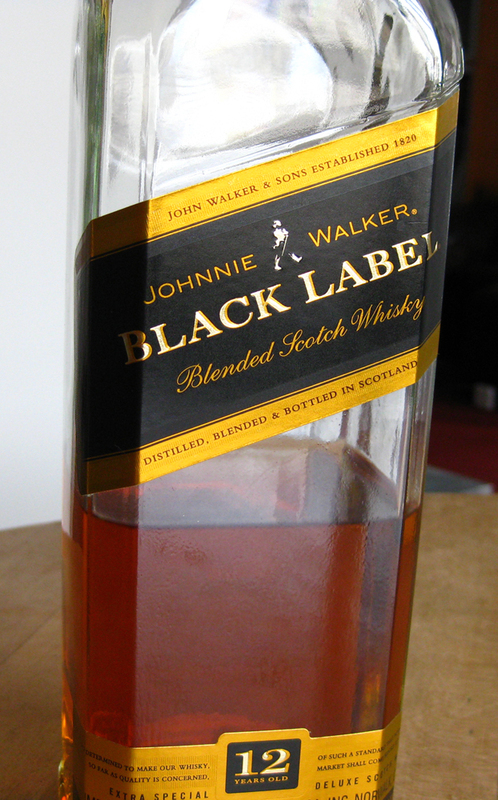 Note: the strained water will be added to the poaching liquid. 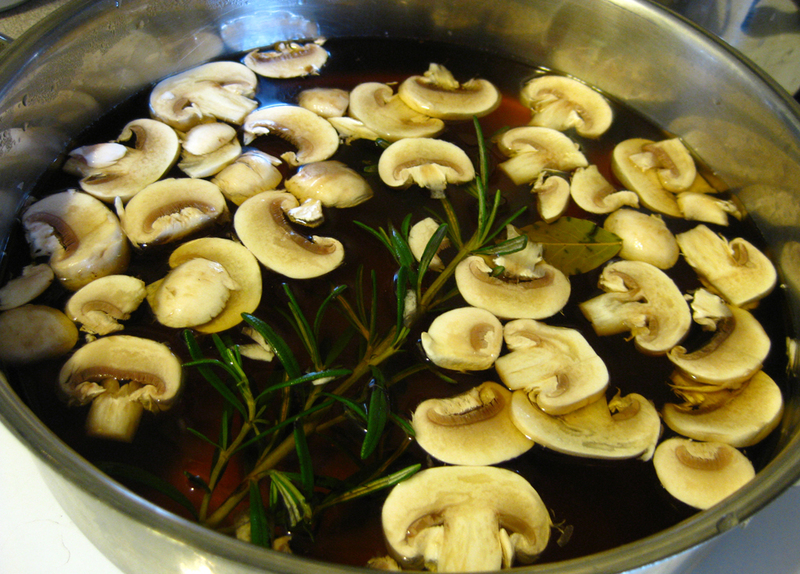 In a large saucepan over high heat add the water, veggie broth, and whisky, along with the sprig of rosemary, sliced mushrooms, and bay leaves. Bring to a boil and simmer for 5 minutes. Season the broth with salt to taste. Keep the broth at a low simmer while preparing the chicken breasts. Carefully butterfly the chicken breasts by cutting through the center of each as if you were opening a book. Do not cut all the way through. Open the breast and place between two sheets of plastic. Using the flat end of a meat tenderizer or the flat bottom of a small sauté pan, gently, but firmly, pound the chicken breast between the plastic making sure to pull the mallet away from the center toward the edges of the cutlet. 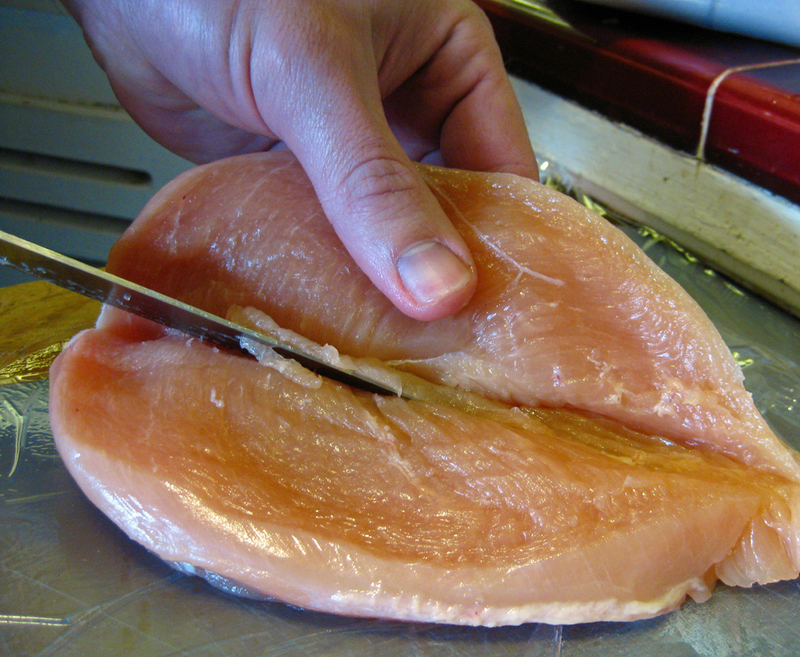 Pound each breast until about ¼ to 1/8 inch thick. Season the inner part of the breast with salt and pepper. Drain rehydrated wild mushrooms, adding the liquid to the poaching broth (do not add the grit at the bottom of the bowl). In the bowl of a food processor, add the rehydrated mushrooms, cheese, shallot, breadcrumbs, rosemary, olive oil, and salt and pepper. Pulse until finely chopped, being careful not to over process. 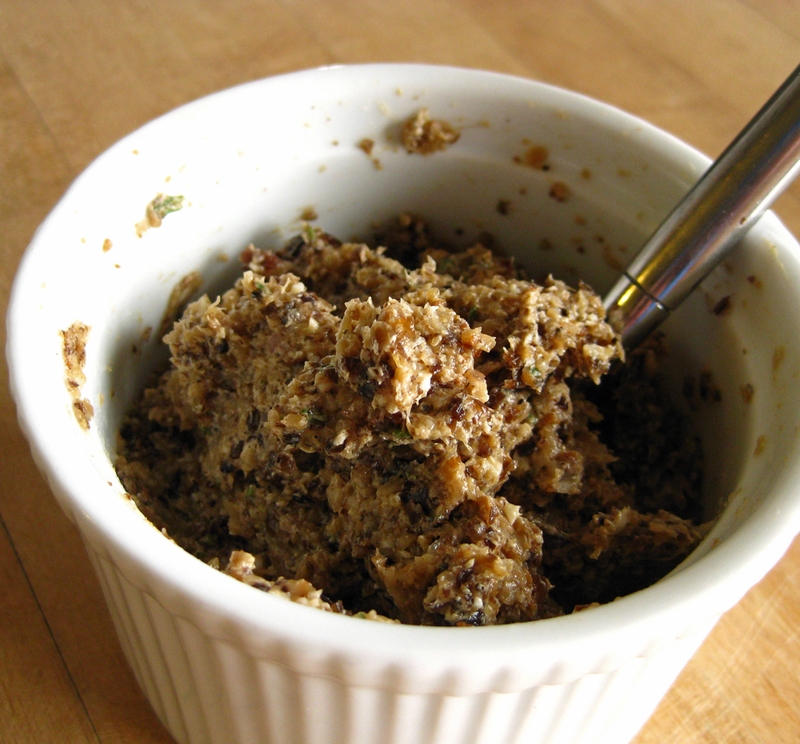 The stuffing can become gummy if ground to a paste. Spread the mushroom stuffing mixture over one side of flattened chicken breast and roll, being careful not to let the stuffing fall out of the ends of the roll. Place rolled chicken breast on a double layer of cheesecloth and wrap tightly. Tie ends off with kitchen twine. Lower chicken breasts into the poaching liquid until fully submersed. Simmer involtini until fully cooked, about 25 minutes or until the internal temperature reaches 160 degrees Fahrenheit. Do not boil. The breasts should cook slowly in the poaching liquid. Remove involtini and allow them to rest for 10 minutes. Remove cheesecloth and slice into 1 inch thick slices. Serve with a large dollop of mashed potatoes and a couple of tablespoons of the poaching liquid. For an Asian inspired soup; substitute the salt in the poaching liquid with soy sauce. Prepare a package of soba noodles as directed splitting the portion between bowls. Add a couple of handfuls of baby spinach and ladle the poaching broth into the bowl. Place slices of involtini in the bowls and top with chopped scallions or chives. « Older Post Two Fungi	» Newer Post Best Cup of Coffee, Ever! Thank you, Christina! This was a fun experiment. This looks insanely good! I’m going to try it! Thanks guys!